India is playing its South China Sea card by restarting oil exploration off Vietnam coast despite China's objections as a calculated geopolitical move to force Beijing to make "compromises" on border issue and its close ties with Pakistan, a state-run Chinese think-tank has said. 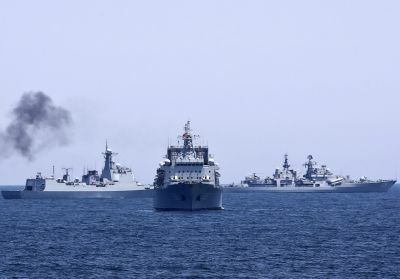 In an article in Global Times, Wang Dehua, Director at the Shanghai Municipal Centre for International Studies, said China should not hype India's role in disputed South China Sea but "guide" New Delhi to work with it in view of attempts by US and Japan who are cosying up to India to strengthen anti-China alliance. India's Oil and Natural Gas Corporation decision to restart oil exploration of in the "disputed waters" is an attempt by India to play the SCS card against China, the article said. “New Delhi has its own geopolitical interests in mind too. By playing the card of the South China Sea issue, it wants Beijing to make compromises on the border disputes or Pakistan-related issues," it said. China has lodged official protests against such moves more than once, because this is not the first time India has explored for oil in the nine-dash line area claimed by China, it said. "India is no longer 'looking East', for it has already been 'acting East'. The current focus of the country's maritime strategy is the 'Indo-Pacific'. "India not only intends to maintain its primary position in the Indian Ocean, but also aims at wielding more influence in the Pacific. That's why it is busy preparing for the upcoming Exercise Malabar, a joint naval drill involving the US, Japan and India, in the Indian Ocean in October," it said. This is the second article in recent days to criticise ONGC's move to drill for oil off Vietnam's coast at the invitation of Hanoi. China claims whole of the SCS as its own which is disputed by Vietnam, the Philippines, Malaysia, Brunei and Taiwan. India asserts that the ONGC move is a commercial operation. Similarly, China defends its various projects, including the USD 46 billion China-Pakistan Economic Corridor in the disputed Pakistan-occupied Kashmir (PoK) as a commercial venture aimed at improving people's livelihood issues. Earlier this month, state-run China Daily in an editorial termed India's plans to conduct oil exploration off Vietnam coast as "illegal" stating that it is an "unwise move" and "do a disservice to maintaining the positive momentum" to improve ties. The Global Times article on Tuesday said India is making forays into the SCS while treating the Indian Ocean as its own sphere of influence. "Therefore, as China is enhancing its relationship with countries within the region, including Pakistan, Sri Lanka, Bangladesh and the Maldives, coupled with the recent news that Pakistan will buy eight submarines from China, New Delhi fears that the balance in the Indian Ocean will be disturbed. "Indians are afraid that the water will be China's in the future," it said. "To be frank, the US is driving a wedge between China and India. Indians should be aware that the biggest competitor against them in that area is Washington itself. "India is hence balancing its ties with each side, in order to get advantages from all," it said. "We should thus not magnify the competition between the two, but focus on developing common interests," the article added.